CHICAGO – John Hillcoat’s “Lawless,” based on Matt Bondurant’s “The Wettest County in the World,” is one of the most high profile disappointments of 2012, a film with an amazing cast that suffocates under the weight of an inconsistent script, a boring lead, and a complete lack of narrative drive. Who would have ever guessed that a movie with so many charismatic actors and actresses could ever be so shockingly dull? It’s nearly an accomplishment. Tom Hardy, Gary Oldman, Guy Pearce, Jessica Chastain, Mia Wasikowska – any one of these wonderful actors typically makes a film better and one could easily assume that having all five of them in one ensemble would lead to dramatic gold. And yet even this level of acting talent can’t save “Lawless.” None of them do anything particularly wrong (although Pearce makes some odd choices) but they can’t save a haphazard script that doesn’t understand basic requirements of storytelling such as presenting the viewer with consistent characters instead of mere cliché. We’ve seen “Lawless” done before and done significantly better. Even with the A-list cast, it’s little more than forgettable. 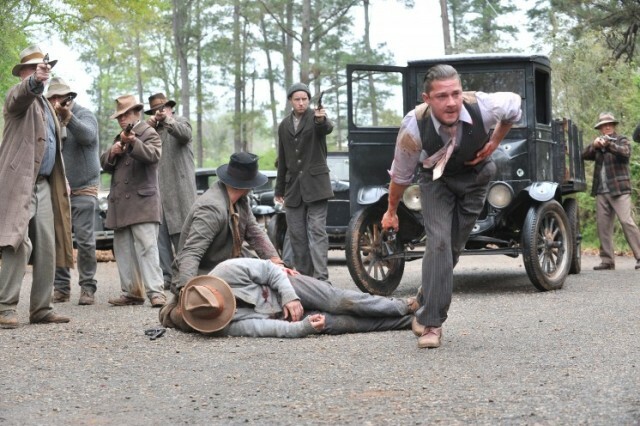 Read Brian Tallerico’s full review of “Lawless” in our reviews section. It’s 1931 in Franklin County, Virginia, known in some circles as “The Wettest County in the World” due to its abundance of illegal alcohol operations at the height of Prohibition. Crooked cops are paid to look the other way as families of bootleggers keep their families fed by getting other ones drunk. An important figurehead of this community is Forrest Bondurant (a mumbling-but-charismatic Tom Hardy), who rises to moonshine prominence with his brothers – Howard (Jason Clarke) and Jack (Shia LaBeouf). Jack may seem the least interesting of the three as he’s the youngest and so the one often in need of rescue but he’s made the narrator here in one of many storytelling mistakes we’ll get to later. Jack works to gain the respect of his older brothers and become as important a Bondurant as his more famous siblings. He works with a friend named Cricket (Dane DeHaan) who might as well be wearing a “Star Trek” red shirt and be named “Inevitable Victim” and he woos a local church-going girl named Bertha (Mia Wasikowska). While Jack is coming-of-age, times are getting more dangerous in Franklin County thanks to the arrival of Special Deputy Charley Rakes (Guy Pearce), a unique character sent from Chicago to clean things up. Meanwhile, notorious gangster Floyd Banner (Gary Oldman) crosses paths with the Bondurants and Forrest falls in love with the lovely new barmaid Maggie (Jessica Chastain). Continue reading for Brian Tallerico’s full “Lawless” review. “Lawless” stars Tom Hardy, Shia LaBeouf, Jason Clarke, Guy Pearce, Jessica Chastain, Mia Wasikowska, and Dane DeHaan. It was written by Nick Cave and directed by John Hillcoat. It is rated R and opens on August 29, 2012.